Blogger Sign up- Bloggy Whatcha Want Christmas Event. 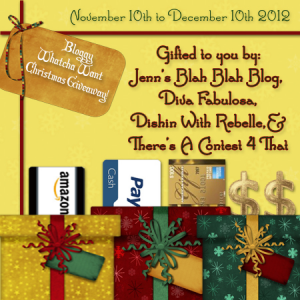 Jenn’s Blah Blah Blog, Diva Fabulosa, Dishin With Rebelle and There’s a Contest 4 That. You’re not going to want to miss signing up for this giveaway! Jenn’s Blah Blah Blog has an awesome event in the works for Christmas, hurry and get a spot, the good ones will fill up quickly! These events are fabulous, with TONS OF COMMENTS! Our readers love them, which is the reason we want to bring another fabulous event their way! So don’t miss out on this awesome blogger opportunity! Remember, if you want the FREE Facebook link for this Super Bloggy Giveaway you have to post an announcement post on your blog. Why help promote? The more bloggers we have in this event, the better prizes we can offer our readers. And the more FUN we all have! SIGN UP FOR THIS FABULOUS GIVEAWAY ON JENN’S BLAH BLAH BLOG. Disclosure: This is not a compensated post and was posted as part of the blogger sign up agreement. I am not managing the giveaway or blogger sign up. Please direct any questions or comments to Jenn at Blah Blah Blogs.